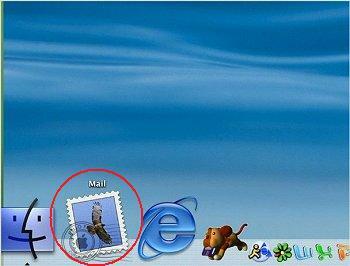 Click on the Postage Stamp icon in your Dock. 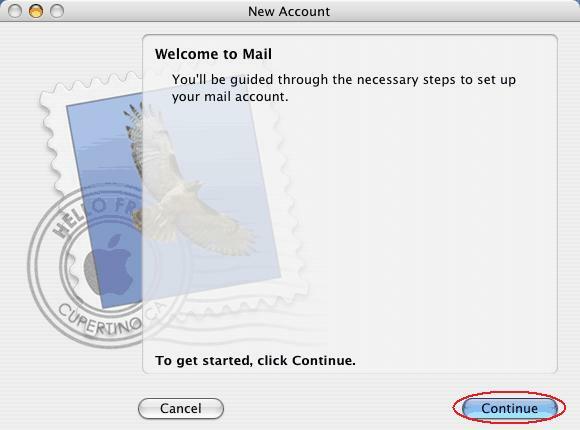 Upon opening Mail for the first time, you will be prompted to configure it to retrieve your email. You will be prompted for some general information about your email. Select "POP" in the "Account Type" pull-down menu. Enter "Mercury Network" for the "Account Description". Enter Your Name in the "Full Name:" field. Enter Your Email Address in the "Email Address:" field. You will be prompted for information regarding the retrieval of new mail.. 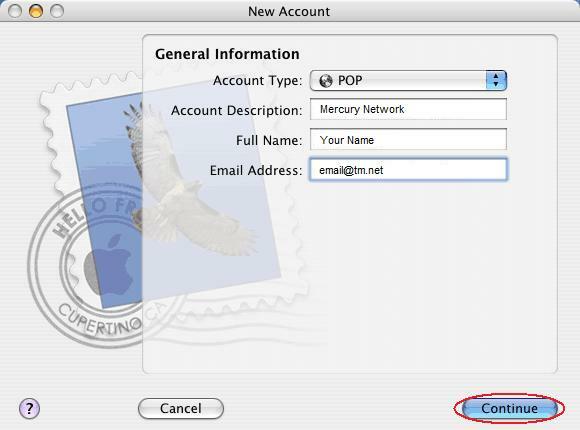 Enter "mail.mercury.net" in the "Incoming Mail Server" field. Enter Your Email Address in the "User Name" field. 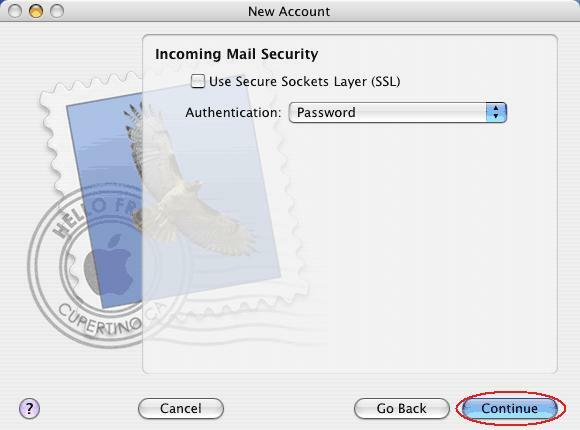 For "Incoming Mail Security", set "Authentication:" to "Password". You will be prompted for information regarding the sending of outbound mail. 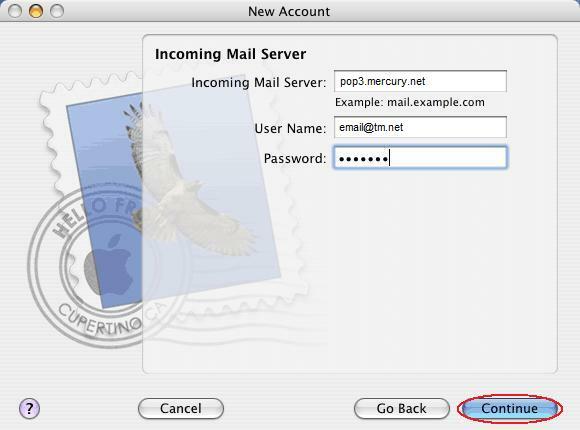 Enter "mail.mercury.net" in the "Outgoing Mail Server:" field. Check the box labeled "Use Authentication." Enter Your Password in the "Password:" field. 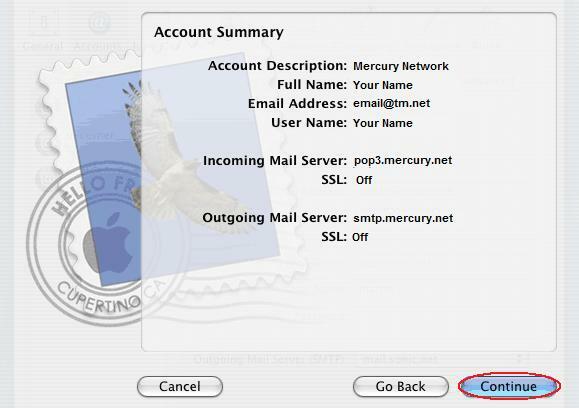 "Incoming Mail Server" should display "mail.mercury.net", with SSL "OFF". 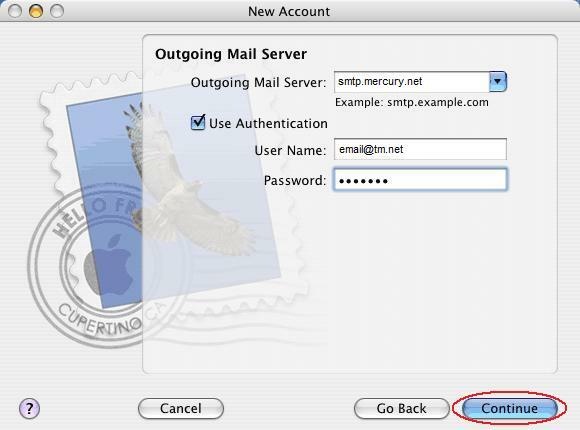 "Outgoing Mail Server" should display "mail.mercury.net", with SSL "OFF". That's it, you should be all set!